Over the next few weeks I’ll be posting some articles written by one of our very own regulars to provide you with some Petanque reading material on these cold & dark winter nights. The first is titled ‘Attitudes to the Game’. The second is about whether to ‘point or shoot?’ and, finally, ‘practice’. Hope you enjoy them and thank you to the author. There are several social aspects to the game in France. There is the village fete where there will be un concours where many of the players will not have picked up a boule since last year. There is the family who come out on Sunday afternoon after lunch for a leisurely game with friends. The retired regulars who play under the trees from four o’clock every afternoon until it’s time for dinner .There are the club members, the licence holders ,many of whom play at a good level and are involved in competitions at club, town, department, region and national levels. This is where the top international talent is developed and youngsters who show promise and a desire to work at their game are helped to progress. However it must be said that many of the top players were introduced to the game by their parents and are often third generation players weaned on the game from an early age, so we are not doing too badly but perhaps the way we sometimes approach the game is not altogether conducive to producing a high standard of play. Leaving aside the sheer difference in player numbers and our short summers, unfortunately the way the game is often played in the UK at club level does little to raise any excitement or attract youngsters . It sometimes resembles a game of marbles played with boules, with eight or more boules around the coche at the completion of an end. The problem seems to lie partially in the tendency to play an overly defensive game. Many pointers can roll a ball eight meters on a flattish terrain with amazing accuracy to beat a close point, but it can be rather boring to watch and unless the game in this country can attract more young players, it may become moribund. 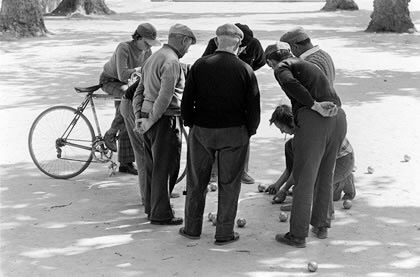 Young potential players appear to view Petanque as merely a grassless version of flat or crown green bowls, a game for old people.